DRIVERS unsure how to correctly turn left from Coolart Road into Frankston-Flinders Road heading towards Peninsula Link and Frankston are causing problems, police say. To solve the problem they must use the dedicated merging lane – but some are incorrectly stopping at the give-way sign, causing traffic on Coolart Road to bank back from the intersection. Merging straight out of Coolart Road into the westbound lane of Frankston-Flinders Road across the solid white line marked on the picture is illegal. Left turn vehicles should turn into the merging lane, get up to an appropriate speed and then use their right indicator to merge across the broken line when safe to do. Merging vehicles crossing the white broken line must give way to westbound through traffic. 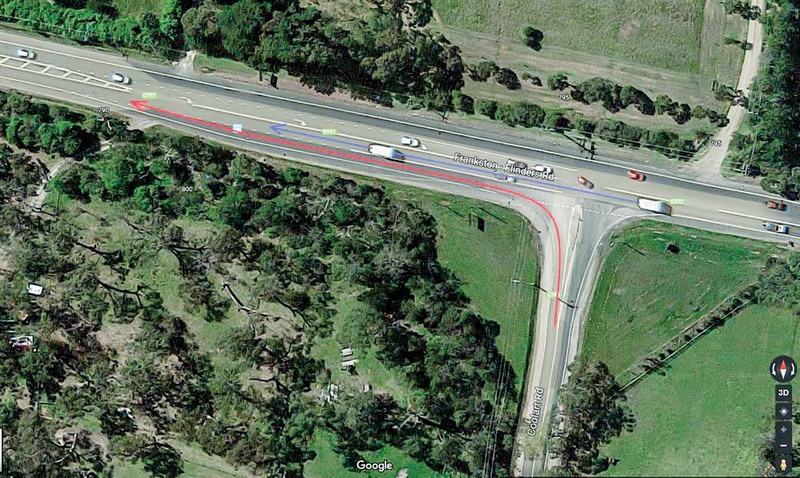 The overhead picture from Google Maps shows the correct left-turn path marked by the red line. The blue line shows westbound Frankston-Flinders Road traffic proceeding past the intersection, separated from the merging lane by the solid white line. The only time left-turn drivers need to stop is when cars further ahead are waiting to turn right and are blocking their entry into the left turn merge lane. If this is the case, they should create a PROPER slip lane.